He was sleeping when I arrived. The driveway was still too icy for an outing, I’d noted on the way to the house. The sun streamed through the windows but the house was quiet. I called a quick Hello then headed to his room. I heard the oxygen machine softly purring as I passed and glanced at the note from his earlier caretaker. He was back in bed. Breakfast was over and the doctor had been by early to draw blood. I knocked then entered his warm sunny room. “Ah, where have you been? I was waiting!” he demanded good-naturedly. As always, my hands were cold and we laughed at my “cold hands, warm heart!” greeting. He dozed a bit longer while I watched his cows beyond the window and tried to reset his clock ahead for the hour change of Daylight Savings Time. “OK let me just find your shoes.” While he shuffled himself to the edge of the bed I fussed with his walker and blankets. “Did you want to give me a back rub?” he asked, perched on the edge of the bed. “Funny thing is I was just thinking I would love to do that!” I guided his feet into his shoes only to realize he was wearing wonderfully thick hand knit wool socks. When I tried to help him to a standing position he balked. “I must be safe in my shoes!” He bent to work his feet deeper into the clogs he wears, the socks fighting his progress. Eventually he was upright and we started the journey to the bathroom. Once there he sat in a chair and gazed out the window at the birds in the “waiting area,” a bush near the feeder. “I like to sit here” he commented as he bathed his face in icy cold water. I offered cream for his face and hands and thought about how many times in life he has gotten up and dashed cold water on that face. This entry was posted in memoir. Tagged aging, creative writing, hospice care, memoir, New Hampshire, Palliative care. Next Post Next post: Puzzle Update! Glad he noticed the happy, spring shoes. That must have warmed his heart. And yours too. I think his time is coming sooner rather than later. I know he is looking forward to Spring and having time outside. At the same time, a small infection can knock him down and make it tough to get back up. Happy shoes, happy heart! Thanks Laura! You got that right! 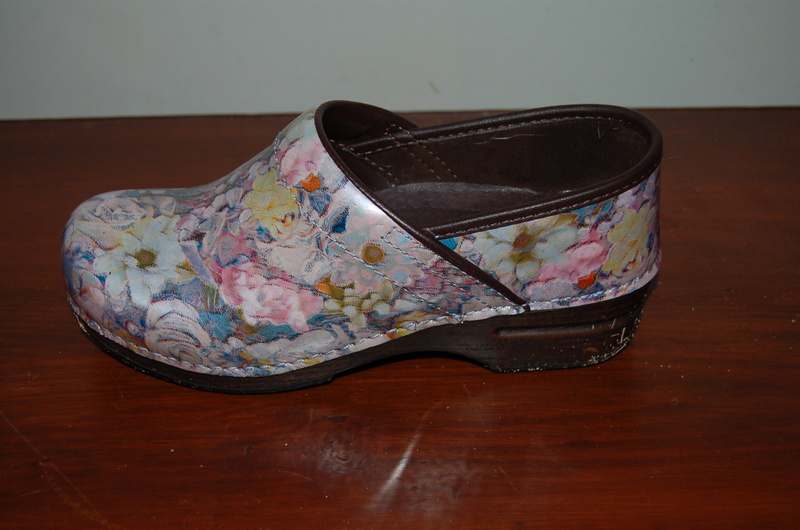 My Dansko clogs may not be fashionable but they support me well. I had to ditch fashion footwear 10 years ago when I was diagnosed with psoriatic arthritis. It’s well under control but I can’t wear heels or flats for very long. I need the arch support. C’est la vie. By the way, Mephisto sandals are really safe footwear for warmer weather. They’re expensive but worth it and last a long time. Thanks Joyce! I will look into the sandals for this summer in the store. Being on my feet all day is very tiring and fashion is no longer a driving factor vs comfort! I’ve never seen shoes like those. It must be tough keeping them clean during mud season. I’ve always had clogs in black or brown. These just struck me as fun. They haven’t been through a mud season yet so we will see how they do! Thank you Susan. He is very special. They really are happy shoes. Thank you! Funny story, I wore boots the other day and he was not happy…Where are the Happy Shoes??! !